I played my first game of Acquire around 1980. During that game I watched other players have an intense match while I played without any good tiles or money during the whole game. I came away from that experience thinking that the game wasn’t any fun. I later decided that I would reexamine the game. There are a lot of grey areas in the many versions of Acquire rules. Many items are not addressed and assumptions have to be made. Because of this, I felt that first and foremost the grey areas needed to be defined. I also felt that there needed to be two major changes to the rules to help even out the distribution of money during game play. These two changes also helped to align the game more to corporate reality. The first rule change pertains to the purchase of stock. I call it the “lame duck” rule. I allow trading of stock when finances are gone. This change was designed to allow players with no money to be able to try to keep control in the companies that matter more. It also helps to relieve the “lame duck” status that is achieved when a player is out of money. The second rule change pertains to the disposition of stock at the time of a merger. I call it the “dumb luck” rule. I eliminated the 2-for-1 trades of stock. This rule is flawed since it doesn’t address the issue of worth or the reality of a hostile takeover. An Imperial (Phoenix) with 41 tiles (worth $1,200 per share) could take out a Luxor (Sackson) with two tiles (worth $200 per share) and the player with Luxor (Sackson) stock could trade two for one. This means that a player can make $800 per trade along with possibly gaining majority in the surviving company. 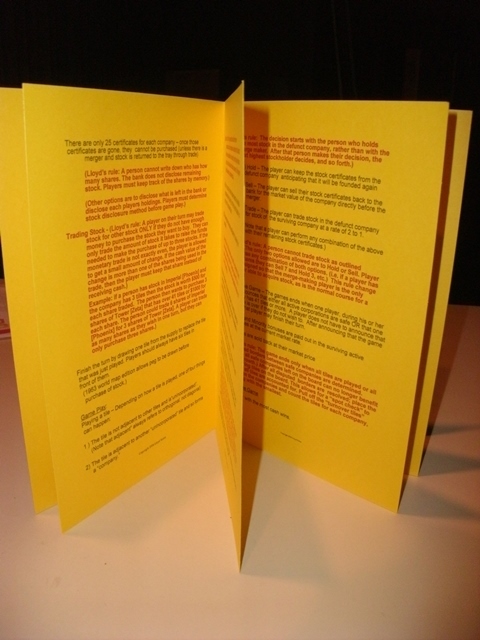 If the player who is holding majority in the surviving company does not have interest in the folding company, they can lose their majority out of the regular turn of play. My change in rule allows only the merge maker to acquire stock, as is the normal course of their turn. The vanquished stockholders are paid for their company and they can invest their earnings anywhere they want when it is their turn. Defining the grey areas and making these changes to the rules creates a more interesting and enjoyable game for all involved. It allows all players to stay involved in the game and keeps the outcome undecided until the very end. 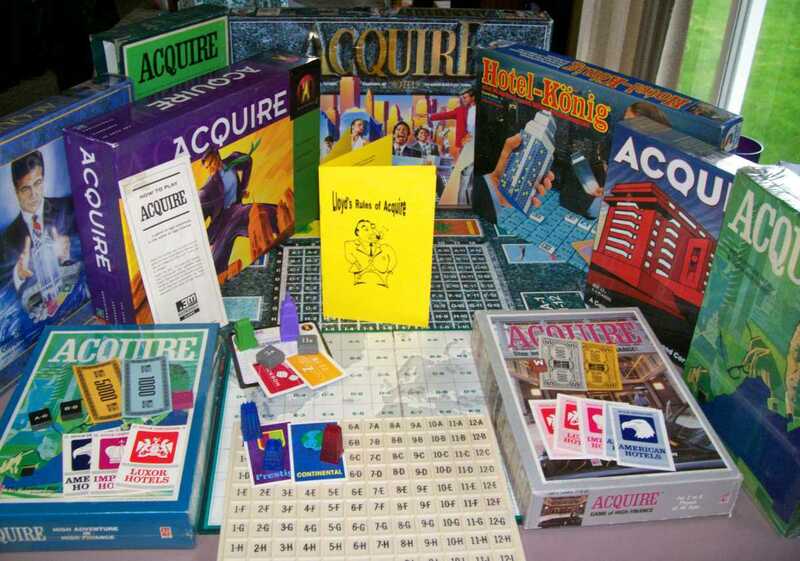 Many different versions of ACQUIRE have been produced through the years. The core of the rules has remained the same but different versions of rules define different grey area. 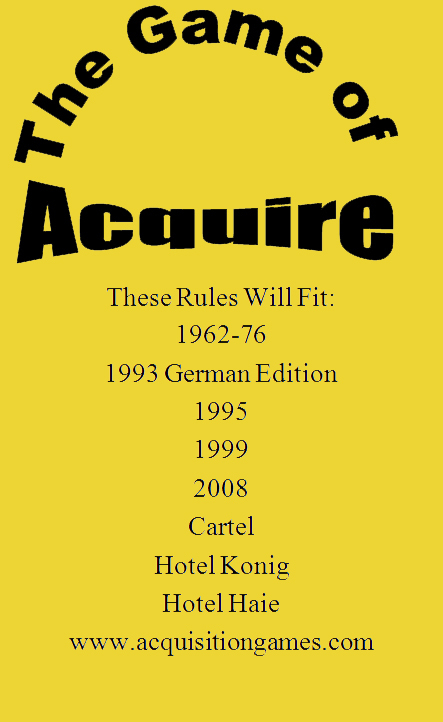 Lloyd’s Rules of ACQUIRE defines the grey areas in one set of rules and provides variants of rules that can be used to offer a more enjoyable experience. I believe these changes will help the player “ACQUIRE” a new love for the game. The main objective of Acquire is to become the wealthiest player at the end of the game. This is done by forming companies and obtaining free stock, shrewdly buying (Lloyd’s Rule: and trading) the right stock at the right time, merging companies to obtain capital and adding tiles to the companies in which you have stock to increase their value. Put the game board in the center of the table with the tiles face down in either the top or bottom of the box. The banker keeps the rest of the money in front of him in four piles. To determine who goes first, each player draws one of the face down tiles and places it on the board. The player whose tile is closest to “1-A” goes first. The progression of tiles goes 1-A thru 1-I and then 2-A thru 2-I; so 1-I is closer to 1-A than 2-A. Lloyd’s Rule: The tiles are placed back into the pile of tiles and shuffled. All players draw 6 tiles and keep them face down in front of them. The play then progresses to the left of the first player. Play a tile on the game board onto its matching space. Buying Stocks - Buy stocks in any active company. No more than three individual stock certificates can be purchased in one turn. Find the name of the company in which stock is being purchased. Refer down the column on the information card to find the current tile size of the company. 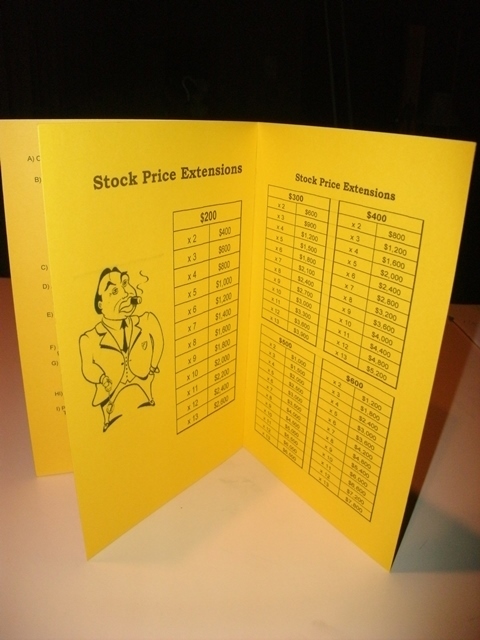 Cross-reference that to the stock price column for the cost per certificate. There are only 25 certificates for each company – once those certificates are gone, they cannot be purchased (unless there is a merger and stock is returned to the tray through trade). Lloyd’s Rule: A person cannot write down who has how many shares. The bank does not disclose remaining stock. Players must keep track of the shares by memory. Other options are to disclose what is left in the bank, disclose each player’s holdings or both. 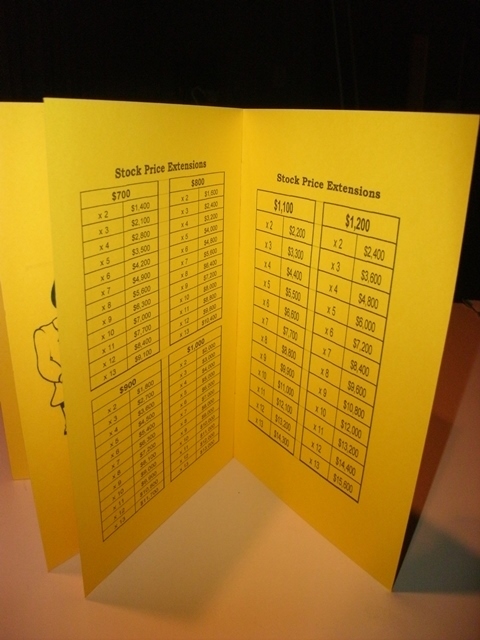 Players must determine stock disclosure method before game play. Lloyd’s Rule: Trading Stock - A player on their turn may trade stock for other stock ONLY if they do not have enough money to purchase the stock they want to buy. They can only trade the amount of stock it takes to raise the funds needed to make the purchase of up to three stocks. If the monetary trade is not exactly even, the player is allowed to get a small amount of change. If the cash value of the change is more than one of the shares being used in the trade, then the player must keep that share instead of receiving cash. Example: if a person has stock in Imperial [Phoenix] and the company has 3 tiles then the stock is worth $500 for each share traded. The person then wants to purchase 3 shares of Tower [Zeta] that has over 41 tiles or $1000 for each share. The person could trade 6 shares of Imperial [Phoenix] for 3 shares of Tower [Zeta]. A player can trade as many shares as they wish in one turn, but they can only purchase three shares. Finish the turn by drawing one tile from the supply to replace the tile that was just played. Players should always have six tiles in front of them to finish a turn. Lloyd’s Rule: If all of player’s tiles would form new companies, but all companies are already on the board with none available to be formed, then the player does not play a tile and does not draw a new one. The player is still allowed to purchase stock. When a company is formed the player selects an available company marker (building) from the tray and places it on any one of the company's tiles. The player gets one free stock certificate for founding the company. Lloyd’s Rule: If all the stocks are held by players, then the founding player gets the “founding bonus” in a cash payment that is equal to the company's value at time of opening. The tile is adjacent to an existing company, in which case the company grows in size by one tile and its stock increases in value according to the stock value chart. A safe company can absorb a smaller company through merger, but can never be absorbed itself. A tile cannot be placed in a location that would cause two safe corporations to merge. Such a tile is discarded and redrawn from the existing supply. Lloyd’s Rule: The tile is turned upside down and placed on the board in the proper location. The player then draws another tile to replace that tile. If you have a tile that would cause two safe companies to merge, you may play it immediately, whether it is your turn or not and immediately draw a replacement tile. Count the number of tiles in each company. Do not include the merging tile in the count for either. The larger company always absorbs the smaller company. If the companies are the same size, then the merge maker decides which company will survive. If a tile is placed that merges more than one company, the larger one survives and the smaller ones become defunct. If merging companies are the same sizes, then it is the Merge Maker who decides the fate of these same size companies. The companies are absorbed one at a time from largest to smallest. Remove the colored marker (building) from the smaller company and return it to the tray. All players reveal how many stock certificates they hold in the now defunct company. The player with the most becomes the “Majority Stockholder” while the player with the next most becomes the “Minority Stockholder”. The Majority Stockholder receives the bonus indicated by cross-referencing the number of tiles in the defunct company and type of company (small, medium, large). The Minority stockholder receives the bonus indicated in the next column to the right. 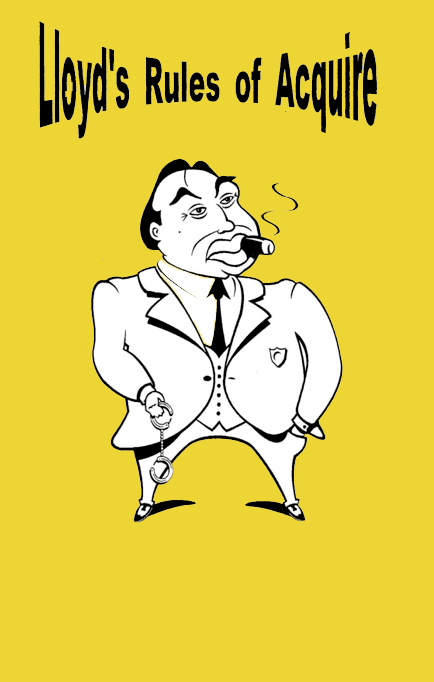 If one player is the sole stockholder in a corporation, that player gets both bonuses. If there is a tie for Majority Stockholder, add the majority and minority bonus and divide evenly between those who are tied; if the bonuses do not divide equally into even $100 amounts then the bonus is rounded up to the next $100 amount. If there is a tie for Minority Stockholder, split the Minority Stockholder bonus indicated among those tied. Lloyd’s Rule: The decision starts with the person who holds the most stock in the defunct company, rather than with the merge maker. After that person makes their decision, the next highest stockholder decides, and so forth. If there is a tie for Majority and the merge maker is a Majority holder, they declare stock disposition first. Otherwise it is the first Majority holder to the left of the merge maker to declare first. Hold – The player can keep the stock certificates from the defunct company anticipating that it will be founded again. Sell – The player can sell their stock certificates back to the bank for the market value of the company directly before the merger. Trade – The player can trade stock in the defunct company for stock of the surviving company at a rate of 2 to 1. Lloyd’s Rule: A person cannot trade stock as outlined here. The only two options allowed are to Hold or Sell. Player can use any combination of both options, i.e. if a player has 10 Shares they can Sell 7 and Hold 3, etc. This rule change is designed so that the merge-making player is the only player able to acquire stock, as is the normal course for a turn. Finish the turn by drawing one tile from the supply to replace the tile that was just played. Players should always have six tiles in front of them. The games ends when one player, during his or her turn, announces that either all active corporations are safe OR that one company has 41 tiles or more. A player does not have to announce that the game is over if they do not wish to. After announcing that the game is over, that player may finish their turn. All stocks are sold back at their market price. Lloyd’s Rule: The game ends only when all tiles are played or all disputed borders between safe companies are determined. (When all safe companies left on the board can no longer benefit from growth.) After all disputed borders are resolved, place the remaining tiles on the board. (This allows for a “tile check” to make sure no tiles are missing.) Pull off the “turnover tiles” between the companies and count the tiles for each company, starting with the smallest. The player with the most cash wins.